Sortimo by Knapheide is a strategic partnership between Sortimo International, a global leader in mobile racking products and The Knapheide Manufacturing Company, the nation’s leading provider of commercial vehicle solutions. This partnership is focused on storage systems especially for commercial vans…our product is called EXXPAND. 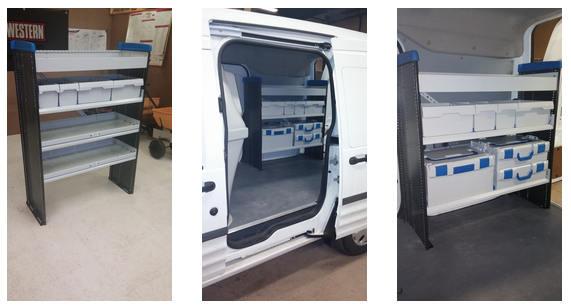 EXXPAND is a lightweight, durable van storage system that creates an organizational solution for your van. The modular design allows for flexibility in both configuration and layout. Shelf Staxx’s modern appearance compliments both the current and new generation of commercial vans. BOXXes help you organize your work equipment and transport it to your worksite in the most efficient way possible. As the core of the Exxpand system, all BOXXes are interchangeable and securely lock into Shelf Staxx for safe transport. FOR A QUOTE EMAIL US TODAY!!! All Rights Reserved © 2014 Madison Truck Equipment, Inc.